"We are thrilled to have KOSÉ come on board as title sponsor of this event," said VWSE Executive Vice President Chris Pearlman. "Team Challenge Cup is a truly global event and the signing of KOSÉ as our title sponsor illustrates the importance of this event around the world." (1/27/2016) - U.S. 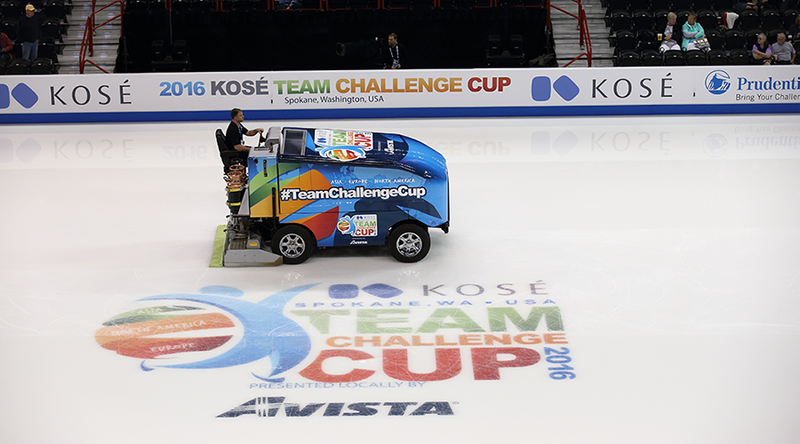 Figure Skating and Van Wagner Sports & Entertainment (VWSE) announced today that Japan-based cosmetics company KOSÉ will serve as the title sponsor of 2016 KOSÉ Team Challenge Cup set for April 22-24, 2016, in Spokane, Washington. A partnership between U.S. Figure Skating and VWSE, Team Challenge Cup (#TeamChallengeCup) is an ISU-sanctioned three-day event that will feature 42 of the top figure skaters in the world competing in a continental team competition (Team North America vs. Team Europe vs. Team Asia). Three teams, representing North America, Asia and Europe, will consist of three ladies, three men, two pairs teams and two ice dance teams. ISU World Standings (as of Jan. 1, 2016) were used to determine the first invitees to 2016 KOSÉ Team Challenge Cup. The top two singles skaters (ladies and men) and top two pairs and ice dance teams from each continent (and from different countries) have been invited to compete with athletes having until February 10, 2016 to accept their invitation. The final singles athletes will be invited based on a fan vote. Teams will compete for $617,000 in prize money. A Legend of the Sport will captain each team. The Team Captain will not compete in the event, but will be involved in nominating skaters for the fan vote and determining team strategy. American Kristi Yamaguchi, the 1992 Olympic champion, and Great Britain’s Christopher Dean, the 1984 Olympic ice dance champion with partner Jayne Torvill, will captain Team North America and Team Europe, respectively. Team Asia’s captain will be announced at a later date. Team Challenge Cup will air domestically on CBS from 1-3 p.m. ET on Sunday, April 24. 2006 Olympic silver medalist Tanith White and 1984 Olympic champion Scott Hamilton will provide commentary for CBS’ coverage. The entire event will be streamed live on icenetwork. Additional international television partners and a detailed broadcast schedule will be announced at a later date. Team Challenge Cup will feature two days of competition (tentative schedule below). Friday’s Singles Short Program will feature the ladies and men performing short programs for the distinction of Singles Short Program champion (team and individual). Saturday’s Singles and Team Free Skate segments will feature an aggregate scoring format to determine the 2016 Team Challenge Cup champion. All-event ticket packages and single-session tickets, starting at $25, remain available for this inaugural event at all TicketsWest outlets, charge by phone at 800-325-SEAT, online at www.teamchallengecup.com or with no ticketing fees at the Spokane Arena box office. For more ticketing information and event details, please visit www.teamchallengecup.com. Friday, April 22 (evening): In the Singles Short Program, each singles athletes will perform his/her short program. The Team earning the most combined points (based on placement) will be crowned the Singles Short Program champion. Results from this segment will not carry over to Saturday’s competition. Saturday, April 23 (afternoon): The Team Free Skate will feature pairs and ice dance teams competing in an aggregate scoring format. Two pairs and ice dance teams from each Team will perform their free skates/dances, with the highest IJS scores in each discipline being added together for a total team score that will carry into the evening’s Singles Free Skate. Saturday, April 23 (evening): The Singles Free Skate will feature ladies and men competing in an aggregate scoring format. The singles athletes from each team will perform their free skates, with the two highest IJS scores in each discipline being added to the Team Free Skate score carrying over. The team with the highest aggregate IJS score will be crowned the 2016 Team Challenge Cup champion. Sunday, April 24 (afternoon): An Exhibition featuring the best skaters from around the world. Team Challenge Cup (#TeamChallengeCup) is an ISU-sanctioned three-day event that will feature 42 of the top figure skaters in the world competing in a continental team competition (Team North America vs. Team Europe vs. Team Asia). Made possible through the cooperative efforts of U.S. Figure Skating and Van Wagner Sports & Entertainment, the inaugural event will take place April 22-24, 2016, at Spokane Arena in Spokane, Washington, USA. Kozaburo Kobayashi, who founded KOSÉ in 1946, poured his limitless passion into making cosmetics that give people dreams and hope. Even during the post-war period of shortages, Mr. Kobayashi committed KOSÉ to making quality products that truly exceeded the expectations of each customer. This spirit remains alive in all facets of our business today, from research and development to manufacturing, from customer-oriented consultative sales to distribution, to our unique brand marketing system that satisfies the various values of each customer. We believe it is this spirit that gives KOSÉ the strength and drives it to do more. U.S. Figure Skating is the national governing body for the sport of figure skating in the United States as recognized by the United States Olympic Committee and the International Skating Union. U.S. Figure Skating is comprised of more than 680 member clubs, collegiate clubs, school-affiliated clubs and more than 950 registered Basic Skills skating schools representing more than 170,000 members. U.S. Figure Skating is charged with the development of the sport on all levels within the United States including athletes, officials, sanctioning of events and exhibitions, and establishing the rules and guidelines by which the sport is governed.